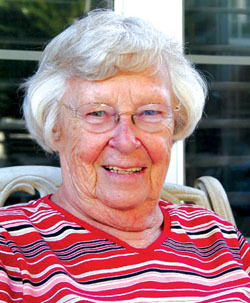 Longtime Idyllwild resident Vi Hallacy passed away on Friday, May 4, 2012, after a sudden illness. She was born in December 1928. She will be greatly missed by her best friend Bill Baker, and by her family, including, siblings Fred and Dee Osborn and Mollie Simons. She was mother to Mary Reed, Rosalie Tipton (Tim), Teresa Randall (Steve), Elizabeth Jonas (Jack), Carol Hallacy (Julie), Patricia Boudreau (Ken), and had many grandchildren and great-grandchildren. Vi is preceded in death by Michael Hallacy. Vi raised her family in Costa Mesa while working as a registered nurse at Hoag Hospital. When she retired after 30 years, she settled in Idyllwild, Calif., where she enjoyed the solitude of the mountains. Vi volunteered and provided leadership for many local organizations such as the Forest Service Volunteers, Mountain Disaster Preparedness, Mile High Radio Club, Radio Amateur Civil Emergency Services and The Woodies. She also knitted caps for premature babies that she donated to an organization that distributed them to hospitals. A celebration of Vi’s life will be held at 2 p.m., Sunday, July 22, 2012, at the Idyllwild Fire Station, 54160 Maranatha Drive in Idyllwild. Donations can be sent in memory of Vi, to the San Bernardino National Forest, in care of Penny Pines Plant-a-Tree Program, 602 S. Tippecanoe Ave, San Bernardino, CA 92408. Please make checks payable to Penny Pines. Donations will be used to plant trees in the San Bernardino National Forest. Vi’s love of the mountains will live on forever with the trees. She is greatly missed by friends and family! What an awesome lady! very sorry for the loss of your mom, and friend. what a contribution she was, and continues to be, in her community and the lives of others. just as she lived. Vi was an exception lady with a passion for helping people, for her family, and for the forest lands in which she lived. We are better people for having known her. She is missed greatly.